Torrance Art Museum (TAM) accepts proposals for Projects and exhibitions. The museum Accepts proposals for group exhibitions and projects. Proposals for solo exhibitions will not be considered. Individual artists are welcome to share their work and/or practice through an online portfolio, website, or in cases of video/film work, links to a reel or selections of their works. Physical portfolio submissions are also accepted by mail only. Please see below for details. All submissions will be accepted for consideration and review for potential inclusion in future programming. TAM does not accept proposals to host exhibitions for juried shows, non-art special interest groups, amateur artists or non-curated/ non-themed exhibitions. I. 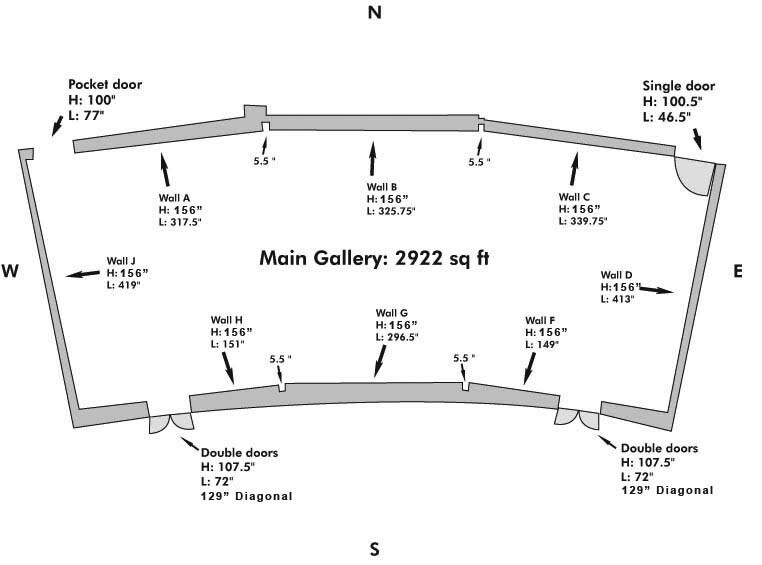 View and/or download the TAM floor plans. This will assist you in how your proposed project may fit into our available space. All proposals must include the following materials. Images representing the work in the proposal or for review. In the case of physical submission, they can be furnished through an enclosed USB drive or optical disc (CD, DVD or HD/Blu-Ray). or an artist’s statement the includes a description of the individual’s practice as well as the series (or multiple series) of work the proposal seeks to highlight. These statements should address source material, concepts and justifications for the proposal. Proposals for exhibitions should include a prospective budget. List all participants in your proposed project along with corresponding CV/Resumes for all artists. Proposals will not be returned. While we appreciate the work put in by all those who do submit, please do not follow up on your proposal with TAM staff. All proposals and that are being considered for future projects will be contacted by TAM staff as will proposals for group shows. Are you requesting consideration for future exhibitions? Are you proposing a curatorial project? Please provide a short description of your proposal. 500 words or less. Thank you! The curatorial staff at TAM will review your proposal. Due to high volume of submissions, TAM is unable to provide status updates on any proposals at this time. If your proposal is accepted, you will be contacted.